Soil health determines plant health, animal health, human health, ecosystem health, and even the health of the economy – we can’t say this enough! Unfortunately, most of our farming practices damage the health of the soil over time and create serious problems for humanity. In order to sort out our issues, we must admit to our own human faults…publicly. Soil, we’ve wronged you by utilizing A LOT of degenerative agricultural processes. In order to achieve our goal of REGENERATION, we need to take a close, comparative look at current regenerative and degenerative agricultural practices currently happening around the world. We’ll start with the truth behind those nice clean rows of tilled soil. We often see tilled soil and think, “that is just what farming is, it actually looks kinda nice in those neat rows” and we may have been told that there are benefits to tilling like decreasing weeds or loosening the soil or increasing aeration. 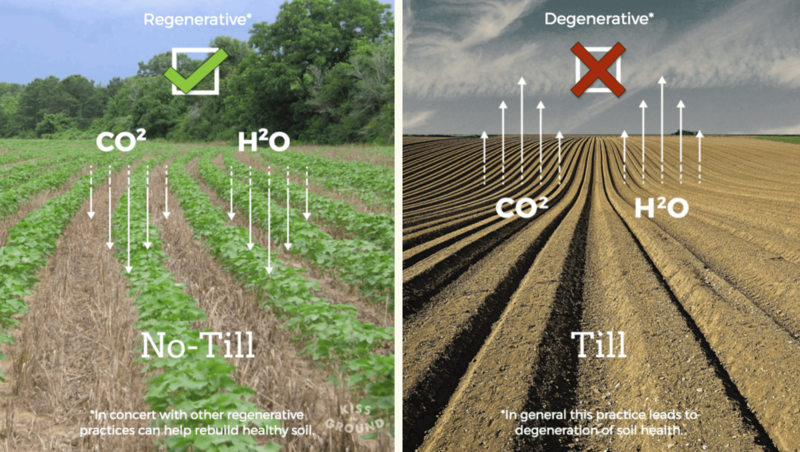 However, there are serious downsides to tillage that wreak havoc on the entire soil ecosystem, reduce its carbon storage, and its ability to regenerate itself. This means that the farmer has left the prior crop’s residue and/or the mass of plants on the soil surface, along with the roots still in the ground and planted the new crop directly into the soil without tilling. Is the process of turning over and breaking up the soil. Kills and destroys critical mycorrhizal fungal networks. Fungi are responsible for: producing acids and enzymes that make nutrients available to plants, creating carbon-based soil aggregates that hold 20x their weight in water, decomposing cellulose and lignin, allowing plants to share resources, helping plants fight off disease and pests, and are a key component of a regenerative healthy soil ecosystem. Pulverizes soil aggregates, which increases soil erosion from wind and water, and also decreases the rate that water can be absorbed into the soil. Brings stored soil carbon to the surface to be oxidized. Mother nature is modest, she doesn’t like to be left naked. Seeing miles of bare soil is a common occurrence in the modern era. Whether driving down the road or flying in a plane, we often experience bare fields as far as the eye can see. We think of it as “Normal” because it’s been done regularly for so many years, but bare soil is not normal. Nature never designed itself to be tilled and left to burn in the sun. The plants that cover the ground are meant to be there to protect, build, and nourish the living soil. Think about your own skin as an example, how does it feel when it is exposed to the hot sun after being scrapped or cut open? Soil did not evolve to be exposed. 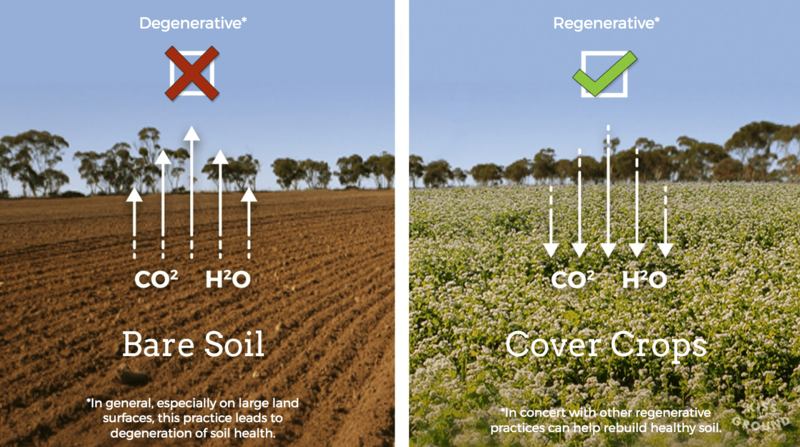 Using Cover Crops, in combination with other regenerative practices, creates conditions where soils can regenerate themselves instead of eroding and/or desertifying. Allows for the burn off of soil carbon through heat, oxidation, and increased activity of bacterial communities. Destroys soil aggregates. Exposed aggregates are fragile and get pulverized by raindrops. This creates a hardened, sealed soil surface that reduces water infiltration, increases runoff and erosion. Latent heat/heat island effect: Bare soil can get extremely hot, not only burning the soil life on the micro scale but can create heat island effect on the macro scale changing the small water cycle so that rains are less frequent. Bare soil reduces infiltration rates of water, this means that rainfall is less effective at restoring soil moisture and recharging underground water supplies. Reduce water and wind erosion (if soil has above ground protection and the root biomass is present, it is far less susceptible to erosion). Protect soil from raindrops. When rain falls on cover crops, the speed of the droplets are slowed down and dispersed, allowing water to gently filter into the soil. Photosynthesize and pump carbon into the ground to share with soil organisms – building soil organic matter and helping reverse climate change. Reduce heat island effect and can help repair small water cycles by increasing beneficial evapotranspiration processes. This means more frequent rainfall and more, “effective rainfall”, increases soil moisture and restoration of aboveground and underground water supplies. Sadly, we haven’t even scratched the surface. But, there is hope when we go beyond degeneration, beyond sustainability, and look through a new lens of regeneration. Stay tuned to learn more about regenerative agricultural practices and the ways you can support them through your thinking, your purchases, your voice and your actions.